About two months ago as we watched a Jamaican Red Eared Slider turtle laid her eggs. Yesterday evening ... the first hatchling ... smaller than a penny. We will be watching daily to see the others as they emerge, and so will the male turtle, who sits like a vulture, waiting, and given the opportunity will eat them as they emerge. For this reason we have separated the pond from the sandy area where the eggs were lain. In the wild, terrestrial turtles lay up to 20 eggs per clutch, and can lay up to five clutches per year. Out of these sometimes only one survives, because they have many predators which include adult male turtles, mongooses and birds to name a few. May to July is the laying period, and eggs take from 60 -90 days to hatch. The turtles at Ahhh...Ras Natango Gallery and Garden are Jamaican Red Eared Sliders and it's a good thing to be able to see them laying in captivity. The pet trade has introduced another type of Red Eared Sliders into Jamaica, and when they get big and children become bored with them they release them into our local ponds. This sounds great but, on the contrary, the introduced specie them mates with our local turtles and all the eggs are sterile, so none hatch. The result is that our local Red Eared Sliders are endangered, especially in areas where the introduced specie are being released. Ahhh...Ras Natango Gallery and Garden has four adult turtles. We got them years agoo as babies from boys who catch the babies when they are basking in the sun. 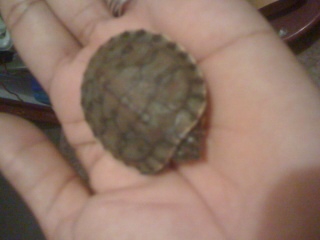 Last year Ahhh...Ras only got one hatchling. This year we were lucky enough to watch as the elder female layed over 20 eggs. We were vigilant, and sure enough on Saturday morning we found one of the males eating a hatchling. So we immediately seperated the nesting site from the pond and yesterday ... another baby turtle. We have to take it indoors as it cannot go into the water until the opening on the belly, where the egg was attached, has completely closed. This opening attracts bacteria from the water and must be kept dried till its closed. Once this happens they survive. At least we can release them into our local pond knowing they are JAMAICAN Red Eared Sliders. Lovely. Preserving our natural resources, one creature at a time. Join in and write your own page! It's easy to do. How? Simply click here to return to Things To See and Do in Jamaica.